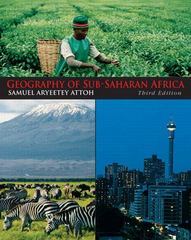 Geography of Sub-Saharan Africa 3 Edition The physical and human geography of Sub-Saharan Africa are explored with a systematic, thematic approach in this multi-faceted reference. Designed to expose readers to a variety of contemporary ideas, theories, and concepts in African geography—and their applicability in “real world” situations—each chapter is written by an expert in the field. Key definitions and basic geographic principles are specified in each chapter, providing a more comprehensive view of the themes presented. Completely revised, this edition examines recent developments and data that are important to understanding the geography of the region. Introduction; Understanding Africa in a Global Context; The Physical Environment; Human-Environmental Impacts: Forest Degradation and Desertification; Historical Geography of Sub-Saharan Africa: Opportunities and Constraints; Political Landscape of Sub-Saharan Africa: From Instability to Democratization? ; Culture, Conflict, and Change in Sub-Saharan Africa; Population Geography of Sub-Saharan Africa; Geography and Development in Sub-Saharan Africa; Transport, Communication, and Information Technologies in Sub-Saharan Africa: Digital Bridges Over Spatial Divides; Urban Geography of Sub-Saharan Africa; Geography, Gender, and Development in Sub-Saharan Africa; Medical Geography of Sub-Saharan Africa; Agricultural Development in Sub-Saharan Africa; Spatial Organization and Distribution of Economic Activity: Industry, and Entrepreneurshipin Africa; Looking Ahead: Prospects for Africa in a New Global Economy. A useful reference for anyone interested in learning more about current issues in sub-Saharan Africa.